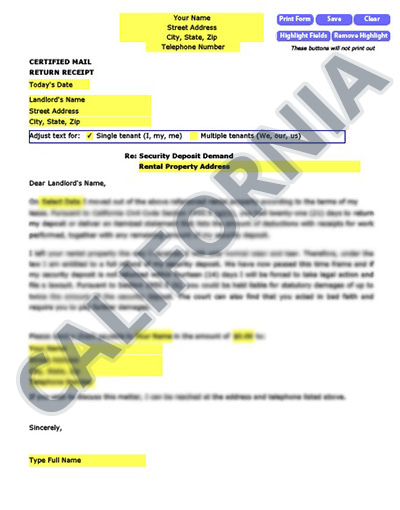 In California if your request for your security deposit return, either orally or in written form, has been refused or ignored then this Security Return Demand Letter is your next step. The requirements of California Civil Code are clear and detailed and if you have not damaged the rental unit and do not owe back rent then retention of your deposit by your landlord, beyond the 21 days from the end of tenancy, is in “bad faith”. At this point your are entitled to sue, but this can take months of your time and cause you unnecessary stress. Our strongly written letter outlining your landlord’s liability, the specific California Civil Code he is in violation of, and the careful expression that it is now in their best interest to settle the matter before a lawsuit is filed. If a judgement is made against your landlord the consequences are severe and our letter details what those are by referencing the specific section of the California Civil code applicable. There’s no reason to accept the loss of your security deposit in California. With this letter it only takes a few minutes of your time to download, fill out, print, and send. You’ve adhered to the law so now your landlord needs to know he is also accountable and liable. As with any correspondence between tenant-landlord, you should always document what has transpired in case escalation to court becomes necessary. Be sure to make a copy of this letter before you send it and mail via certified mail, return receipt requested. Our letters for California renters are tailored to your state, with the right laws to get your landlord’s attention. We’ve taken care of the Security Demand details so there’s no hassle on your part to find the right law and craft an approrpriate letter. Our letters have been used in California and all over America with great success.